Features inexpensive ARM® Cortex®-M4 microcontroller development systems available from Texas Instruments and STMicroelectronics. 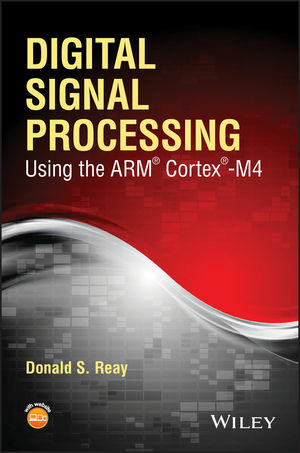 This book presents a hands-on approach to teaching Digital Signal Processing (DSP) with real-time examples using the ARM® Cortex®-M4 32-bit microprocessor. Real-time examples using analog input and output signals are provided, giving visible (using an oscilloscope) and audible (using a speaker or headphones) results. Signal generators and/or audio sources, e.g. iPods, can be used to provide experimental input signals. The text also covers the fundamental concepts of digital signal processing such as analog-to-digital and digital-to-analog conversion, FIR and IIR filtering, Fourier transforms, and adaptive filtering. Digital Signal Processing Using the ARM® Cortex®-M4 serves as a teaching aid for university professors wishing to teach DSP using laboratory experiments, and for students or engineers wishing to study DSP using the inexpensive ARM® Cortex®-M4. DONALD S. REAY is lecturer in electrical engineering at Heriot-Watt University in Edinburgh, Scotland. He has also taught hands-on DSP, on a number of occasions, as a visiting lecturer at Zhejiang University in Hangzhou, China. He co-authored Digital Signal Processing and Applications with the TMS320C6713 and TMS320C6416 DSK, Second Edition (Wiley, 2008) with Rulph Chassaing, and is the author of Digital Signal Processing and Applications with the OMAP-L138 eXperimenter (Wiley, 2012).